There are 2 methods to setting up Super Smash Bros Legacy XP. The modded and non-modded methods. NOTE: If you plan on playing this on Dolphin on Android you may need a NAND dump. Not 100% sure on this, but I’ve seen an error that states this. There is a video at the bottom if you want visual aid. Download the [Dolphin] 7z. Use WinRar to open it. There are 2 folders inside. The 1st folder (Dolphin LXP) is the emulator you will be using. The 2nd folder (Legacy XP) is used to make the game file. You also need a legit copy of Super Smash Bros. Brawl dumped. It NEEDS to be around ~8GB in size. Do not use anything around 4GB, I’ve seen some copies online that are around this size and will not work. Place your game disc .iso file in the WBFS/Builder folder and run the appropriate build script (.bat for Windows, .py for Mac). You will now have a Super Smash Bros Brawl Legacy XP.wbfs file in your WBFS folder (go back out of the Builder folder). Go to your “Dolphin LXP/Config” folder and run “Dolphin LXP.exe”. Double click on the text in the center that says setup your games directory and browse to your “Legacy XP/WBFS” folder. Super Smash Bros Brawl Legacy XP should now show up in the center screen. Continue to the next step. Go to Tools > Install WAD and select the “Legacy XP/WAD/Legacy XP Launcher.wad”. Now go to File > Open > Select the “Legacy XP/WAD/Legacy XP Launcher.wad”. NOTE: If you’re on a modded Wii console you would patch the WBFS, put it on your USB launcher, install the WAD and select it from your channels to launch the game. You are now playing the game, enjoy! NOTE: This is for non-modded Wii consoles. You do need a legitimate copy of Super Smash Bros. Brawl. You can’t use a burned copy or anything like that. Download the [Wii] 7z. Use WinRar to open it. Place the contents of Smash Bros LXP [Wii] on the root of an SD card. You might need an SD card around 8GB. 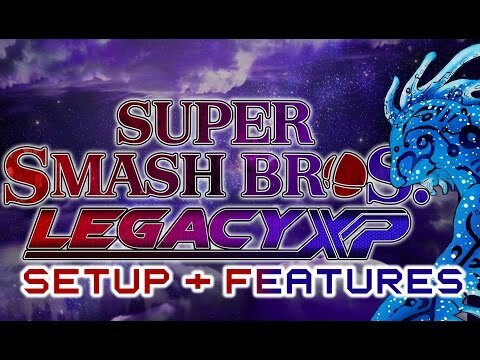 Use Homebrew launcher to launch the Super Smash Bros. Legacy XP Launcher.